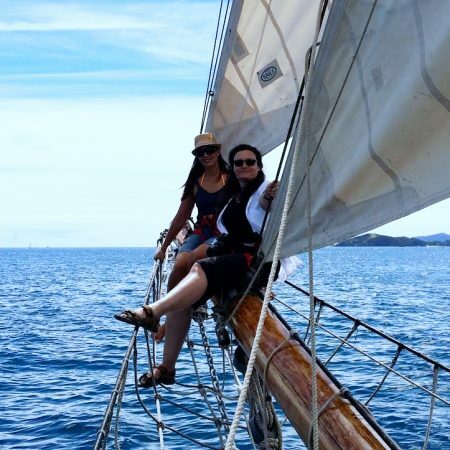 Enjoy an unforgettable sailing charter in the Bay of Islands. A sailing and boating paradise, the region offers calm waters, sheltered ports and breathtaking vistas. While you’re in the region, take advantage of New Zealand’s world-class fishing, diving and snorkeling and cruise between the 150 undeveloped islands that dot the surrounding seas. If you’re looking to enjoy the best of what New Zealand has to offer, sail the Bay of Islands on board a charter yacht. Whatever type of boating you prefer, the Bay of Islands guarantees you a sailing holiday to remember. Whether you’re new to sailing, or you want to develop some more advanced sailing skills, there is a sailing course to suit you. You’ll learn to sail with a small group out on the water. Once you’ve mastered the basics, you’ll leave your instructor behind and sail the Bay of Islands by yourself. For those experienced sailors looking to get out on the water, a yacht charter is the perfect way to see all that this region has to offer. You will be free to make your own itinerary and sail as much or as little as you like. Find secluded beaches, take island walks, go fishing and even swim with dolphins. Most companies offer yachts between 28 and 45-feet. A few companies also offering bareboat yachts (sail yourself) and others with skippers and cooks to allow you to completely relax while cruising the area. Competition is fierce in the region and as such, yachts are extremely well-maintained and presented to ensure your trip is hassle-free. The Bay is studded with islands enveloping the mainland in varied geographic beauty and unspoiled sailing grounds. There are a huge number of calm anchorages within sheltered waters. Within the Bay, sailing distances between the islands are short and peaceful. Take your time and visit Roberton Island’s twin lagoons, Moturua Island‘s walking trails, Urupukapuka‘s farmlands, sandy beaches and stunning views. Find your own peaceful hideaway among many secluded coves. New Zealand’s climate is temperate. The best time to take a boating holiday is between the warmer, drier months of November and April. The prevailing winds are from the westerly quadrant, south-west through north-west Beaufort 1- 4 between November and April. There is a tidal range of two metres. The region is so prized for its sailing conditions that it plays host to Sailing Week in January of each year. From sports boats to superyachts, Bay of Islands Sailing Week is the biggest regatta of its kind in New Zealand, and one of the Southern Hemisphere’s premier yachting events, attracting entries from around New Zealand and overseas. Being further north than Auckland and the Hauraki Gulf, the Bay of Islands generally enjoys somewhat warmer temperatures and sunnier skies. Protected anchorages and fiord-like passes make it the perfect place for your cruising holiday.